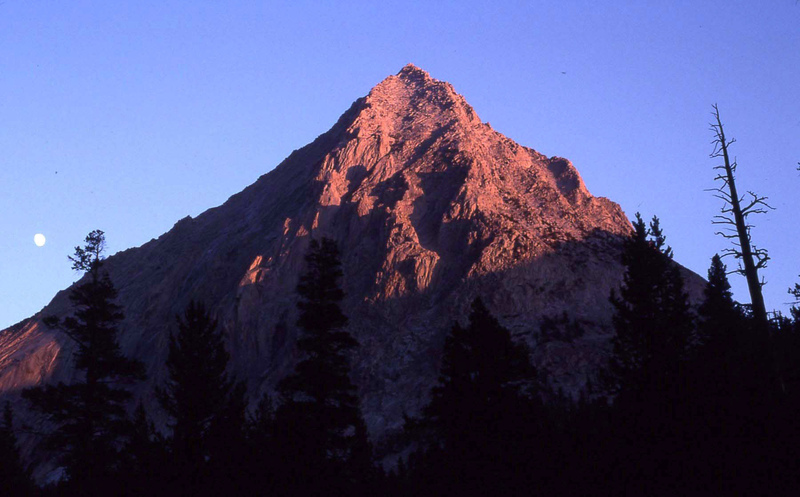 In the summer of 2000 the annual PCS Climborama visited the upper Bubbs Creek area and climbed many of the peaks. Since I didn't make that trip I decided to visit the area this year and climb a few of the peaks. Daryn Dodge and myself spent the night before at the Onion Valley campground to escape the 109F temperature in Independence. First Day, Hike In: Early the next morning we made the familiar five-mile crawl up Kearsarge Pass and down to the Bullfrog Lake Creek and Muir Trail junction for lunch and to soak our feet. A short hike then took us down to Vidette Meadows and south on the Muir Trail a short distance to the bear box campsite. This campsite had a great view of the North Face of East Vidette and also was quite close to the Vidette Lakes trail. 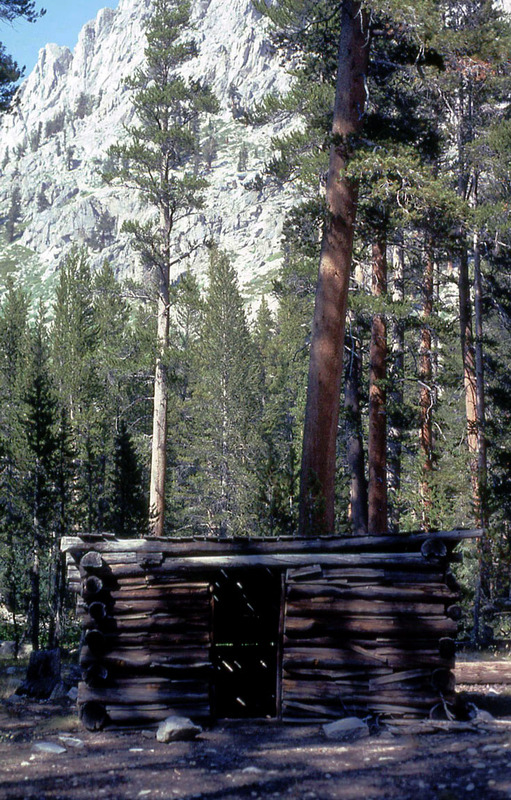 Second Day, Deerhorn and West Vidette: Early the next morning, we crossed Bubbs Creek and quickly found one of Shorty Lovelace's cabins at the junction of the Vidette Lakes trail. Shorty was a fur trapper that worked the Bubbs Creek and South Fork area during the 1930's and 1940's before it was a national park. He was a short man that built several of these tiny cabins that were just big enough for a fireplace, a bunk and a table that he used during the winter when he was working his trap line. (By the way, to locate this Vidette Lakes trail, shortly after leaving the bear box campsite in Vidette Meadows, before the trail begins to climb a hill, leave the trail and head to the right and find a convenient place or log to cross Bubbs Creek. 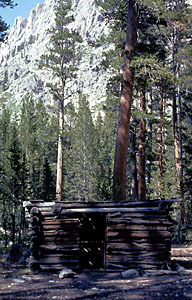 After crossing the creek, locate this cabin and the rough, old trail begins about 15 yards west of the cabin.) We headed up the trail that steeply climbed the hillside. As you reach the top of the hill the trail traverses to the south, crosses a small creek and enters an area that is covered with avalanched trees. At that point we lost the trail and just followed the logical path up the final rise to the lowest Vidette Lakes, which lie at the base of East Vidette. We continued past this lake and headed to the right (west) at the inlet to avoid the cliff band that rises south of the lake. There's a section of grassy ramps that cut through the cliff area that facilitate the route to the next lake, which is the largest in the Vidette lakes basin. We traversed around the west side of this lake on slabs and talus until we reached an obvious talus chute that heads southwest between cliffs and slabs towards Deerhorn Mountain. After about a 1,000' climb up, this chute tops out in a talus-covered basin about a half a mile north of Deerhorn. At this point I decided that I was too tired to continue the climb and went back to camp. Daryn covered the rest of this climb. After another 10 minutes, I was at the toe of Deerhorn's northeast buttress route. Attacking the toe head on looked more difficult than class 3, so I started up the right side of the toe. 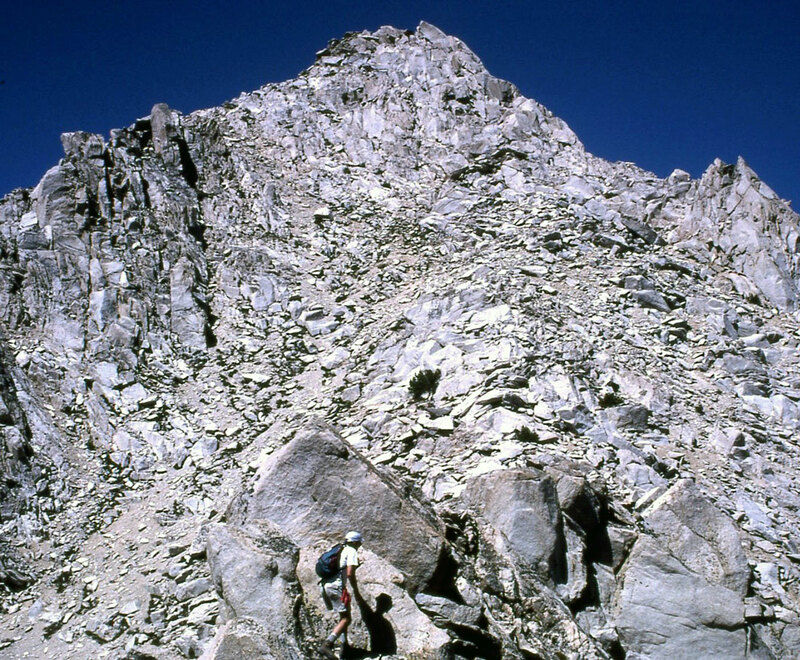 The first 200 feet consisted of a number of unpleasant scree covered ledges. However, once I got on top of the buttress, the climbing was clean, fun granite slabs and boulders. As I ascended I moved to the right or to the left over the top of the buttress to keep the climbing to class 2-3. I could not see the notch between the two summits of Deerhorn as I was climbing. At one point I went left to see where I was in relation to the notch only to get myself stuck in class 3-4 terrain. But I did finally see the notch, which was still just above me. So I moved over to easier rock on the right side of the buttress and continued up another 50-100 feet. At this point I could easily see the notch and the obvious ramp described in Secor's guide below me. At the notch itself, I continued southwest and slightly up around the shoulder of the main Deerhorn summit. I then worked back over the shoulder where it meets the main summit tower, and continued southeast across rock ledges until I could see the easiest class 3 route leading to the summit. Other climbing accounts have described the route from the notch as S' shaped, and I would agree. Deerhorn has a wonderful view of Mt. Stanford's west face. Descending the buttress was actually easier because I could see the entire route below me. 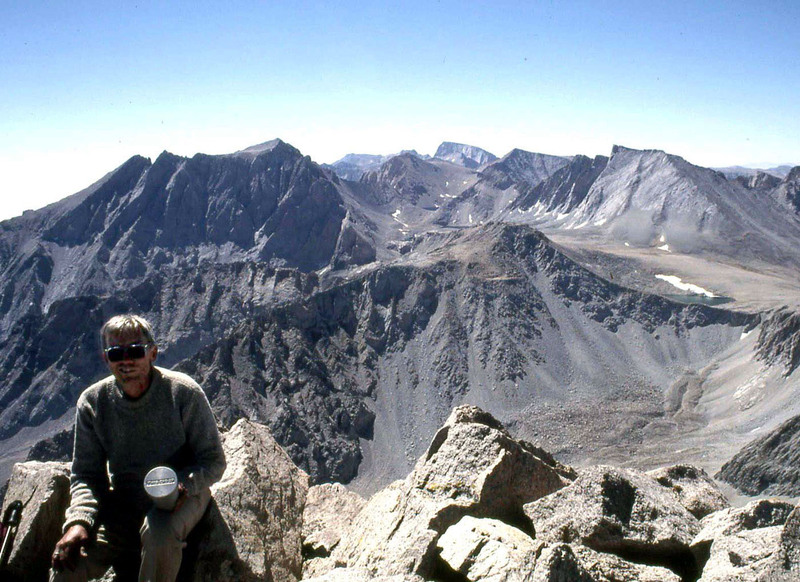 Once off of Deerhorn, I contoured across the talus filled basin at about 11,500 ft. elevation with the plan of climbing West Vidette. I crossed the mouth of one wide basin and then continued north into the next basin where one can begin the climb. I went right around a big moraine pile to more solid rock and climbed until I could see the headwall of the basin. A huge talus fan was at the base of the headwall. Two obvious ramps were at the top of the talus fan and lead up and right towards the West Vidette summit. I took the first ramp, which was class 2-3 due to steep smooth rock at the beginning. The other ramp, which was about 100 feet farther up near the headwall, did not appear to be as steep. 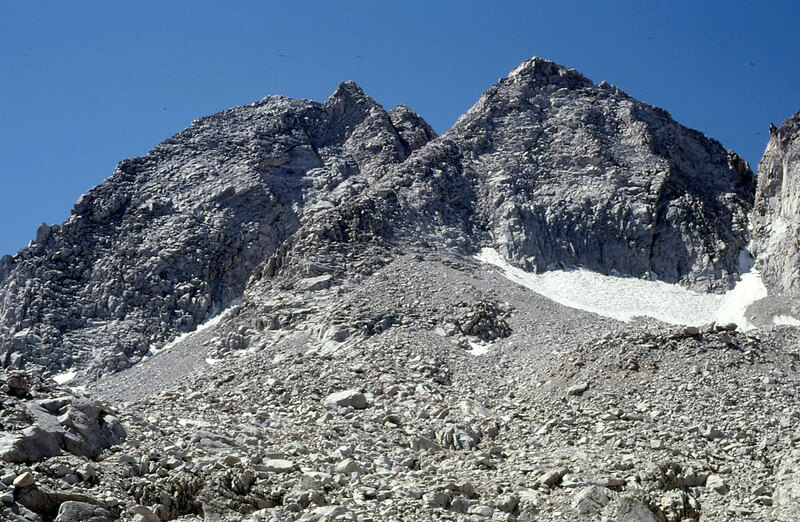 The ramp leads into scree, which in turn leads to the rocky ridge. After another 10 minutes of scampering up and around the knife-edge, I was at the top, where there is an incredible view of Stanford, Deerhorn, and Ericsson. For my descent I took the northeast chute down to Vidette lakes. Never Again! After crossing a couple of minor ridges north of the summit, and bypassing a couple of east-facing, nasty-looking avalanche chutes, I found the descent route. However, it consisted of dried, hard-packed mud that I had to slide down sideways. No plunge stepping on your heels is possible here. This fatiguing descent finally gave way to loose talus and scree near the lakes. Bagging these two peaks in a day left me pretty tired by the time I reached camp. Even though the total mileage for the day was 9 or 10 miles, it was a hard 10 miles. Third Day, East Vidette: The next morning we left our scenic Vidette Meadows campsite and moved our camp up the trail about a mile to the next bear box (9,900'), which was close to the base of East Vidette. We set up a quick camp and dropped our food in the bear box and headed back up the trail towards East Vidette. After reviewing the route descriptions we decided to try a route in between the southern approach to the East Ridge and the Tidball east face chute. We climbed up increasingly steep slabs that rose from Bubbs Creek and aimed for the solid rock that was just north and below the gendarme on the East Ridge. Several hundred feet of steep and enjoyable class 3 climbing brought us up to the north side of the gendarme and then onto the East Ridge. To keep the climb interesting class 3, we stayed directly on the ridge until it ended at a notch. From the notch we climbed several hundred feet up along the right side of a chute that brought us onto the south ridge of the peak. A hundred feet or so of somewhat intricate up, down, around to the right and then to the left brought us to the summit area where we were surprised to see several large angular summit rocks. The final move to the 12,563' summit was class 3, but there was a significant amount of exposure down the 2,000' north face if you slipped. Fortunately, the register was adjacent below in a more relaxing spot. There were no ascents in the register for three weeks, which surprised me. This peak was one of the more enjoyable peaks that I've climbed in a while with good quality solid rock and moderately challenging route finding. Time up from our camp was 2.5 hours. We made our descent down the south ridge and chute that we had ascended to the notch but decided to try the south face since it looked like a quick descent down the sand and scree slope. It went fine for 1,000' until we noticed that there was a cliff band below us and there we stopped and carefully looked for a route. Near the bottom of this south slope there is a short class 3 ledge and gully system that heads down to the west and cuts through the cliff band to the talus bowl below. Secor rates this route class 1 but there did not appear to us to be a class 1 route up this side, may be class 2-3. Once in the bowl it was a quick descent through the talus, down the slabs near the creek, around the East Ridge, down to the Bubbs Creek crossing and back to camp. Great climb, perfect weather! Fourth Day, Mt. Bradley: The next morning found us on the trail again moving our camp, this time up to Golden Bear Lake in Center Basin. The night before had gone below freezing and we noticed ice along the trail several places, Fall was on the way. The turn off the Muir Trail to Center Basin is just before you reach the uppermost Bubbs Creek bear box, at about 10,400'. You can tell that this trail is old by the way that it attacks the hillside directly, rather than wasting time traversing at a moderate angle. It was tiring but efficient and took less than an hour from the turnoff. We found a good campsite just off of the trail and about 100 yards away from Golden Bear Lake with a great view of Center, Bradley, Keith, University, East Vidette and Bago. I decided to take a rest day while Daryn took off to climb Bradley. Here's his account: I took the west face route, as described in Secor's guide. The entire route cannot be seen from Golden Bear Lake, but becomes obvious as one climbs up the chute. The first third of the climb consisted of fairly solid talus and went fast. However, I was then bogged down in loose scree that was about as rough as it comes. I groveled my way up the scree trying to stay to the left side of the chute where I thought there was more solid rock. I don't think it mattered. Near the top of the chute, one can move right onto class 2-3 rock without much scree. The summit mass at the top of the chute is quite impressive. Secor's guide says to follow a narrow chute on the southeast side. However, I would characterize the chute as being on the northeast side of the summit blocks. And you have to down climb about 20 feet to get to the beginning of the chute, which is blocked by a boulder. The boulder is easy to work around though. 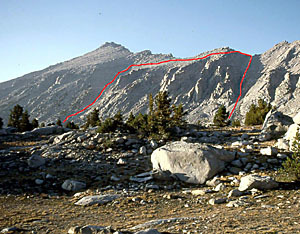 The short chute leads one onto the north side of the summit blocks; with the actual summit only a few minutes walk away. Bradley has an amazing wide-open view of Owen's Valley. Plunge-stepping back down the scree was not as much fun as I thought it should have beentoo many big loose rocks mixed in. Fifth Day, Mt. Keith: Early the next morning we crunched our way over the frozen grass and meadow towards the black cliffs on the northeast base of Mt. Keith. Along the way we found a small solitary bear print frozen in the mud along a tarn between Bradley and Keith. We climbed the right side of the large talus pile that was just to the left of the black water stained cliffs. At the top of the talus we found a ledge system that ran to the right across the top of the lower cliff band that provided an easy way for us to access the northeast bowl. A short walk above the cliffs soon brought us to a wonderful scenic meadow campsite at 12,400' with grassy sand flats with a cold stream along side. After this, the typical steep, unstable talus dominated our 1,000'climb up the slope, which was south or left of a dominant ridge up to a sandy saddle at the base of the summit mass. This saddle, which is at 13,500', has a great view to the south of Mount Williamson, which is only three miles across the deep gulf containing the Shepherd Pass trail far below. For those of you that have ever drank from the only reliable creek on the Shepherd Pass Trail below Anvil Camp this sandy slope is the source for that cool, clean water. 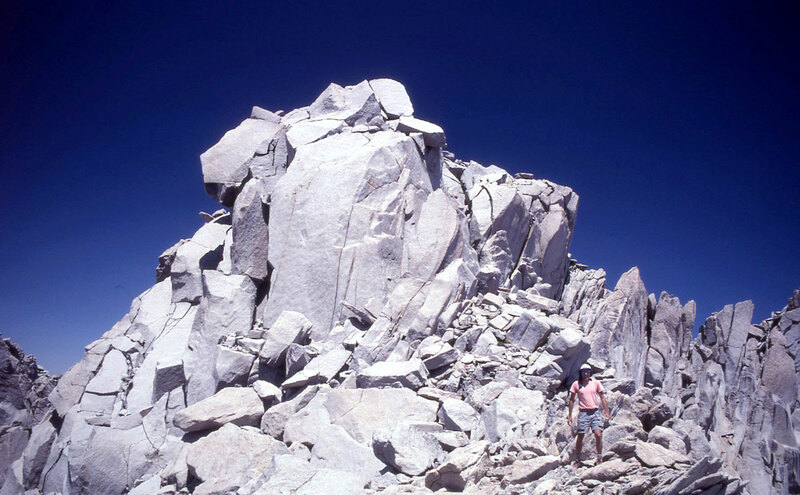 The final climb up to the summit was a low angle sand climb occasionally interrupted by a few boulders until we reached the summit mass at 13,977'. Total time from our camp was 3.5 hours. The views were great and ranged from Goddard, Darwin and the Palisades in the north to the smoke enveloped Great Western Divide in the South. Even when the climbing on peaks like Mt Keith isn't very stimulating or interesting, climbing these major high peaks and just being on the summit has a certain aura of beauty and sacredness that makes them long remembered special places. After a relaxing lunch reading the summit register and seeing if the Verizon cell phone would work (it did), we glissaded down the sand slopes that we had ascended and were at the base of the mountain in only an hour. As I was content to take my time lazily wandering back to camp and enjoy the pristine alpine meadows, Daryn decided that since Center Peak was right there, he needed to climb it so his account follows: From the basin just north of Mt. Keith, Center Peak was only a 1200-foot climb and went rather quickly. I went up the standard, class 2 east chute described in Secor's guide but stayed right of the major scree where there was more solid rock. Near the top, I moved up and left through some fractured rock in a poorly defined cliff band to keep the climbing to class 2. I could then work right on towards the summit. The register was at the base of the actual summit, which was a big rectangular block with one end stuck in the top of the mountain. I was a little surprised because I did not expect this final obstacle it is not mentioned in Secor's guide. However, it is described in other climbing accounts and in the latest SPS List; I just wasn't paying attention. Anyway, after a little study I found the route to overcome this final impediment and did a short-lived, crouched victory dance (very small steps) on the very top. The summit rock is rated class 4 on the SPS list, but it seems more like class 3 because the exposure was only an 8-10 foot drop. However, adding another 10 feet in exposure would certainly make this a class 4 summit block. The plunge-stepping back down to camp was fast and fun, but not as good as the Mt. Keith descent. Center Basin has an incredible view of the Bubbs Creek Valley. Sixth Day, University Pass or Secor's Wrong Pass: By the sixth day I was very mellow and content with only having climbed two peaks, which considering my recent medical problems was great. The only remaining peak to climb was University and we thought that we could climb it from the pass. 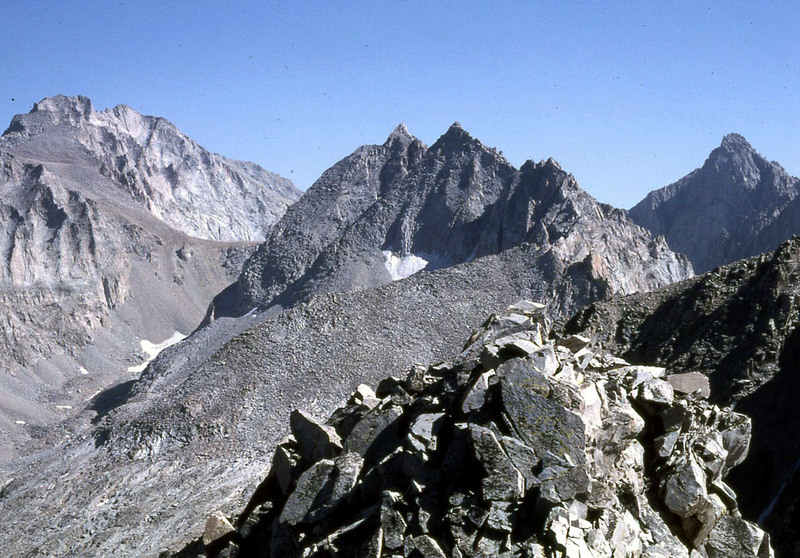 In Secor's second edition he omits any description of an approach from the west and only shows a picture of University Pass (on page 144) that he labels as the first saddle to the right or south of the peak. But what you can't see from the picture since it's hidden behind Center Peak is that the real University Pass is next to Peak 3926 (12,877'). Both the pass and Peak 3926 seem to be labeled wrong in Secor's book! Anyway, at dawn we were off heading towards what we thought was the right approach to the pass from the northernmost Center Basin Lake (11,100'). From the west outlet of the lake the huge talus pile is very obvious and heads to Secor's Pass. After an hour and a half of climbing steep, loose sand on top of loose rock with full backpacks, we arrived in the middle of this large sand bowl. I was exhausted and things didn't look good since we were now still several feet below the top of this sand bowl but we were above Center Peak, which is 12,750', and the pass was supposed to be at 12,600'. Daryn took off his pack and checked out the notch above and said that it didn't look right and then traversed south. Almost a half an hour later he returned and said that the correct pass was around the corner and below us. I was very tired and mad at this point. We had been stupid enough to rely on a picture in a guidebook instead of relying on our own common sense to find this pass. We had planned to climb University Peak but at this point I was so tired I just wanted to get to the pass and get down the ugly steep broken rock as soon as possible. We descended from our sandy bowl down and around to avoid cliffs and finally climbed to a much more obvious pass right next to Peak 3926. Looking down the slope to the west that we should have ascended, I remembered seeing a steep talus and scree chute that had a chock stone in it from our camp, which was the correct way to the pass. I believe that the correct approach to this is from where the Center Basin trail enters a wet marshy area on the north. Before you get to Golden Bear Lake you should leave the trail and head northeast just to the left of Peak 3926 (see map). After this misguided fiasco I will definitely be posting a correction at the Climber.org site. Meanwhile, back at the pass, Daryn's disappointed, I'm exhausted and mad and just want to relax, but University Pass isn't quite the place. I go first and head down the steep, loose slope which someone described as what a mountain looks like after a nuclear bomb goes off. Big loose boulders, sand, scree, ice, and lots of sharp rocks slid down around me as I made my way. Daryn soon followed in an avalanche of debris. We soon faced an undercut cliff band area below us but a quick survey pointed out the route down a ledge system towards Robinson Lake. We finally reached a rest spot on a snowfield and thought that our big troubles were finally over. Looking back to the west, the correct pass was quite obvious. We then descended field after field of large to huge talus that seemed to go on forever until we finally broke out of it just above Robinson lake, and took a well-deserved rest. A short hike of less than an hour brought us down to the Onion Valley Campground and our cars. Summary: We climbed six peaks, Deerhorn, West Vidette, East Vidette, Bradley, Keith and Center in six days. We had a great time and got the opportunity to discover an error in Secor's second edition.